The lawn and garden robot market has increased in size in recent years, as manufacturers of robotic lawn mowers with established operations in Europe penetrate the US market and small start-ups grow and develop new products. In 2017, Honda Motor and Zucchetti Centro Sistemi began offering robotic lawn mowers in the US after sales in Europe. Start-ups like Franklin Robotics, Left Hand Robotics, and The Kobi Company are working to get their products commercially available. Other well-known lawn and garden companies are also working to enter the US market with robots of their own. For instance, LG and iRobot are developing robotic lawn mowers, while Deere and Company is looking into the North American market. Through 2027, sales are expected to accelerate as battery technology improves, mowing quality increases, and new navigation technologies (e.g., no boundary wires) are commercialized. These innovations will aid the expansion of the market in the US, where consumers have larger yards. More powerful batteries with longer run times and systems that can more easily map and navigate larger spaces will be needed for widespread adoption in the US and movement into the commercial landscaping and turf maintenance space. The increased commercialization of multipurpose lawn and garden robots – as well as specialty versions that perform weeding and snow blowing tasks – will also boost gains. As the production of innovative equipment grows, prices of existing models will fall, making lawn and garden robots more competitive with conventional equipment designed for small or medium spaces or the cost of hiring professional services. However, in the longer term, average prices will rise again as new technologies take over. Lawn and garden robots remain relatively unknown products in the US. Marketing efforts need to expand and target demographics with high potential for sales. Additionally, as more manufacturers develop products for US households and expand distribution networks, consumer education of lawn and garden robots will grow organically. Expanded consumer awareness will also stem from seeing robots successfully deployed in residential and commercial settings. Increasingly, there are segments of the population that are either unable or uninterested in performing lawn and garden maintenance tasks. While some consumers who prefer do-it-for-me (DIFM) lawn maintenance will hire professional landscapers, others may opt to purchase lawn and garden robots. Labor-saving robots are particularly important for older generations like baby boomers – who may no longer be able to perform heavy labor – and for consumers with busy lifestyles who do not have the time to take care of a yard. 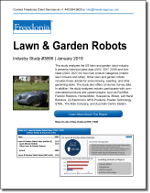 This Freedonia industry study analyzes the US lawn and garden robot market. It presents historical sales data (2012, 2017 and 2018) and forecasts (2022 and 2027) by product (robotic lawn mowers and other lawn and garden robots). Other lawn and garden robots include those used for snow blowing, weeding, and other gardening tasks. The study provides consumer survey data. The study also analyzes industry competitors and up-and-coming companies, including FarmBot, Franklin Robotics, Honda Motor, Husqvarna, iRobot, Left Hand Robotics, LG Electronics, MTD Products, Positec Technology, STIHL, The Kobi Company, and Zucchetti Centro Sistemi.